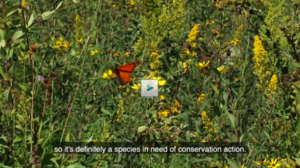 SMITHFIELD, Va., Nov. 01 /CSRwire/ - Smithfield Foods, Inc. is the first food company to participate in a new program with Environmental Defense Fund (EDF) and Roeslein Alternative Energy (RAE) to restore key prairie habitat for monarch butterflies, as described in this video. Their efforts are helping bring back the iconic insect, which has experienced a 95 percent population decline since the 1980s and could be listed as a threatened species in June 2019. However, the monarch is currently undergoing what is anticipated to be the largest migration in 10 years. Attracted to the program’s dual benefits, Smithfield contributed $300,000 to fund the planting of native grasses and monarch-friendly native milkweed and wildflower species on 1,000 acres of land on and surrounding its hog farm in Missouri. Since the 1990s, Smithfield has explored ways to transform hog manure into renewable energy. Smithfield recently announced the nationwide expansion of these efforts through Smithfield Renewables, a platform that unifies, leads, and accelerates the company’s carbon reduction and renewable energy efforts, while helping meet its industry-leading goal to reduce greenhouse gas emissions 25 percent by 2025. In Missouri, the food company has worked with RAE since 2014 to transform manure into renewable natural gas and is now looking to prairie grass as an alternative feedstock, particularly useful during the winter months. Together, Smithfield, EDF, and RAE are creating a compelling ecological and financial model for the growth and management of native prairie across the agricultural landscape. Ultimately, the unlikely collaborators are working to achieve a more resilient and ecologically diverse agricultural landscape. Environmental Defense Fund (edf.org), a leading international nonprofit organization, creates transformational solutions to the most serious environmental problems. EDF links science, economics, law, and innovative private-sector partnerships. Connect with us on Twitter, Facebook and our Growing Returns blog. Roeslein Alternative Energy was founded in 2012 as an operator and developer of renewable energy production facilities that converts agricultural and industrial wastes, along with renewable biomass feedstocks to renewable natural gas and sustainable co-products. RAE engages in these business operations with a focus on incorporating native prairie restoration. RAE is a limited liability corporation with its principal office located in St. Louis, Missouri. To find out more, please visit www.roesleinae.com.